Certain international media and international politicians try to use any news coming from Venezuela as an opportunity. They spin the news on the Venezuelan Elections, and on Chavez, to draw �their Caracas agenda� from their right drawer. Maybe clarity has been lost, but is not Chavez�s government a government for the people of Venezuela? Why is his form of government demonized by some international politicians? Is socialism not a powerful movement in Europe and in the US? Voters turn out in Venezuela was massive. The people of Venezuela proved that they are committed to a full participation. Although Chavez�s party lost seats, what really upsets certain politicians and certain �independent� media is not the elections outcome. It is Chavez�s policy of nationalizing natural resources and all that which his party represents. Opposition groups in Venezuela have the right to speak out and voters can vote whatever way they want. That is elections, that is democracy, that is a government for the people and by the people. Certain international corporations (who have their eye set on the Venezuela�s gas and oil reserves) are not part of the people of Venezuela. They are more interested in going back to the old days of "good business" when Venezuela was the place of oil beyond their borders. Venezuela is still the place for oil and gas, but today Venezuela is much more. Venezuela is internationally known today for its power and for living by a strong symbol. So, Was this a defeat for Venezuelan democracy? Was this a defeat for Chavez government? Was this a defeat for the people of Venezuela? There are two agendas. One agenda is filled with lobby groups and all those corporations that finance political seats across the world to seek international resources and then there is another agenda. It can be seen in the streets of Venezuela. The political party of the opposition marched dressed in yellow and the supporters of Chavez took the streets dressed in red. They not only filled pages of every newspaper around the world, they filled the streets. 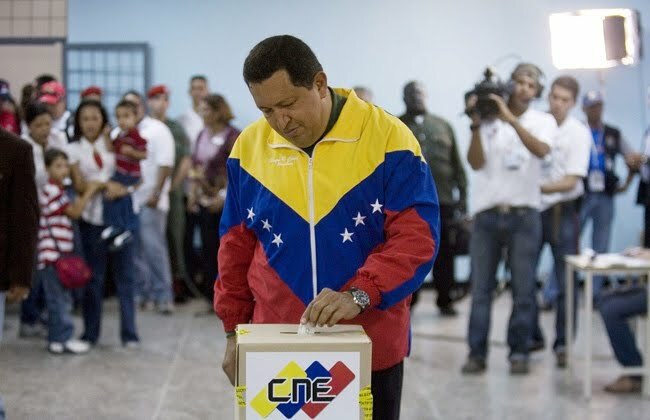 Like the coat Chavez used when he voted. The Venezuela�s Flag is both red and yellow.